I threw this risotto together the other night, freehand-style, because I just happened to have some arborio rice leftover from making my seafood paella, and canned pumpkin in the pantry— but a bunch of you guys asked for the recipe, so I went to work at refining it to nail down a super easy recipe! 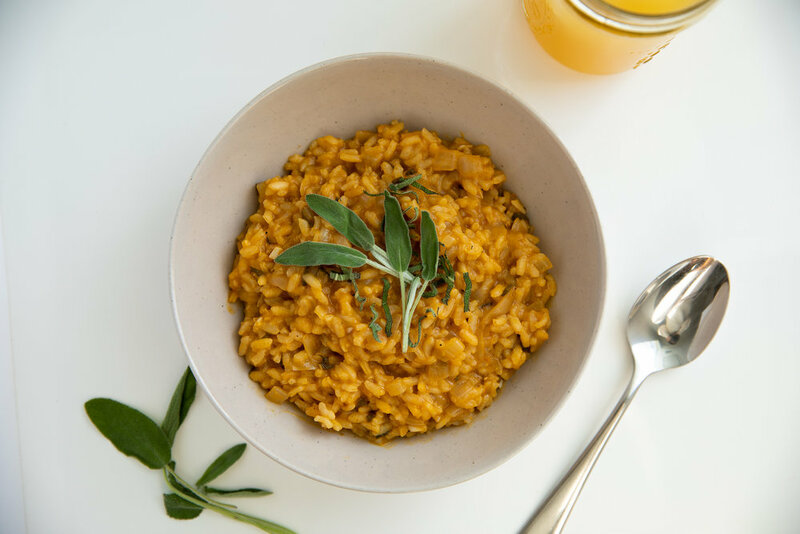 This pumpkin sage risotto is gluten-free, dairy-free, nut-free, and vegan, so it’s a pretty easy crowdpleaser amongst finicky stomachs. Risottos are awesome because they’re pretty straightforward, yet easily customizable without messing them up. People tend to classify risotto as a “heavy” food, because it’s traditionally true. Conventionally, it’s made with loads of butter, cream, and an Italian grandma somewhere insisting it include a brick of cheese. While I’d love to have that in my dreams, I’ve modified risottos over the years to not piss off my delicate flower of a tummy. And guess what? I prefer these because they feel super rich and utterly satisfying, yet I don’t have to go in a food coma for 2 hours afterwards. I think Grandma Romano would even approve if she took a spoonful! Now as for this recipe specifically— I’ve been trying to get more spontaneously creative in the kitchen and use more herbs. But I started this out with one of my tried and true combinations: winter squash and sage. Pumpkin or butternut squash combined with sage is one of the coziest, aromatic, and ‘feels fancy but it’s not actually’ duos. I’ve put butternut + sage together many times on the blog (aka my butternut squash carbonara w/sage-maple bacon, and my classic roasted butternut w/brown-butter sage — don’t forget the sage-maple roasted chickpeas too! ), but this is the first time I’m putting pumpkin and sage together on the blog for the first time. I’ve tested this recipe a few times now and while I think I’ve found the perfect balance of spices, you could easily throw in some turmeric (don’t forget the black pepper!) to add some anti-inflammatory goodness, or nutritional yeast to make things feel “cheesier,” without throwing any of the technical aspects of the recipe off. So feel free to experiment! *TIP: if you’re in a hurry, pre-heat the broth, as it will cook the risotto faster. Heat 2 tbsp of olive oil in skillet/pot over medium heat. Once heated, add onions and garlic to pot. Stir and cook for about 3 minutes until fragrant. Add sage leaves, and cook for another minute. Add the remaining 1 tbsp of olive oil, arborio rice, paprika, and cinnamon (+ any additional spices you wish) to pot. Stir to evenly coat rice in olive oil. Let rice toast up and cook until translucent around edges and even a little toasty brown. Pour in white wine to deglaze— stir continuously until all liquid is evaporated. Pour 1 cup of broth into pot and stir occasionally until liquid is nearly all absorbed. Repeat again for the 2nd and 3rd cup of broth. Then add pumpkin purée alongside the 4th/final cup of broth. Stir well to combine, and continue to stir occasionally until mixture is creamy and most of liquid is absorbed. Mix in salt + pepper to taste (and if you want to add nutritional yeast to make it '“cheesy,” now would be the time), garnish with additional sage leaves, and then serve while it’s hot.